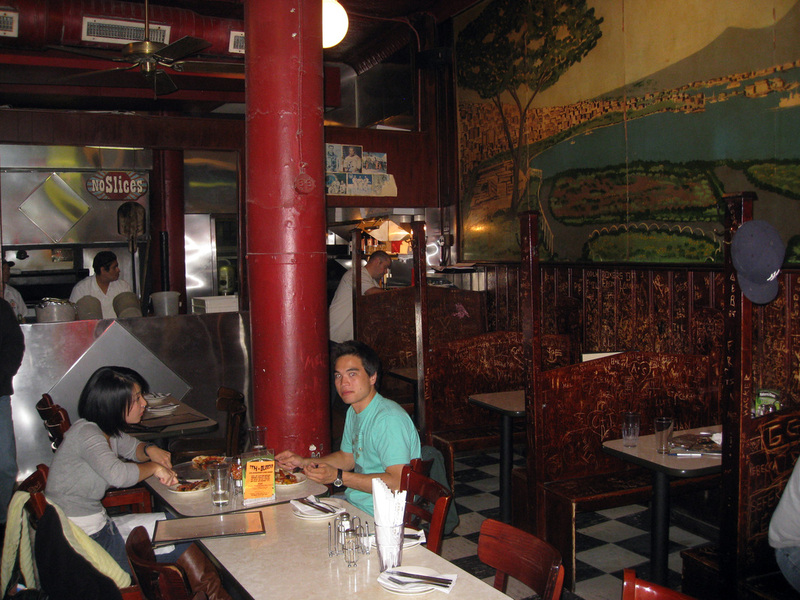 There are many pizzerias in NYC that claim to have New York's best. John's is one of them. And, truly, the pizza is fantastic! Light, crispy, fresh, every bite had a perfect mix of cheese, toppings, and crust...almost. That said, it may not be the perfect pizza for everyone. It's not heavy, it's not loaded, it's not a ton of food. I would call it 'light pizza'. For me, it was perfect. For others, maybe not so much. So, is it NY's best? I don't know. I guess we'll have to eat more, and you'll have to stay tuned...If nothing else, the atmosphere is truly old-style, dark, comfortable, cozy. I can see it perfect for a late night meal on a cold Winter's day. One of the oldest pizzerias in New York City, John's has such an unassuming storefront you might walk right by if you don't know any better. In fact, the night before we ate here we DID walk by without even noticing. Sheathed by a large red awning and having very small outside windows, John's looks more like a dive bar on the outside than a great restaurant. Once inside, however, you are met with a very comfortable, quaint, old-style pizzeria that makes you feel immediately at home. Well-worn checkerboard linoleum floors lay underneath cozy wooden booths covered with 'scratchitti' (a new word I've learned since coming to NYC). In the back, a small counter and the large 850 degree pizza ovens. Loud, but not obtrusive, funk and R&B music plays overhead. Service varied depending on who was serving us. One server was very friendly, helpful, and accommodating. The other treated us as if he wished we would die. Overall, the service was quick and efficient. Our first server helped us with our order, suggesting we don't load up the pizza too much or we won't be able to taste its goodness. He was almost right. John's only accepts CASH. Although there was an ATM by the bathrooms and a bank around the corner, James choose to walk to the nearest Bank of America. Unfortunately he got delayed (ie: lost) and came back after I had already enjoyed a slice of the pizza. We asked one of the waiters if they would heat up the pizza up again. He warned us it may come out burnt, and that it did, as shown. John's offers you so many pizza options it can make your head spin. You can choose one of their 50 combinations, or create your own from a list of toppings. 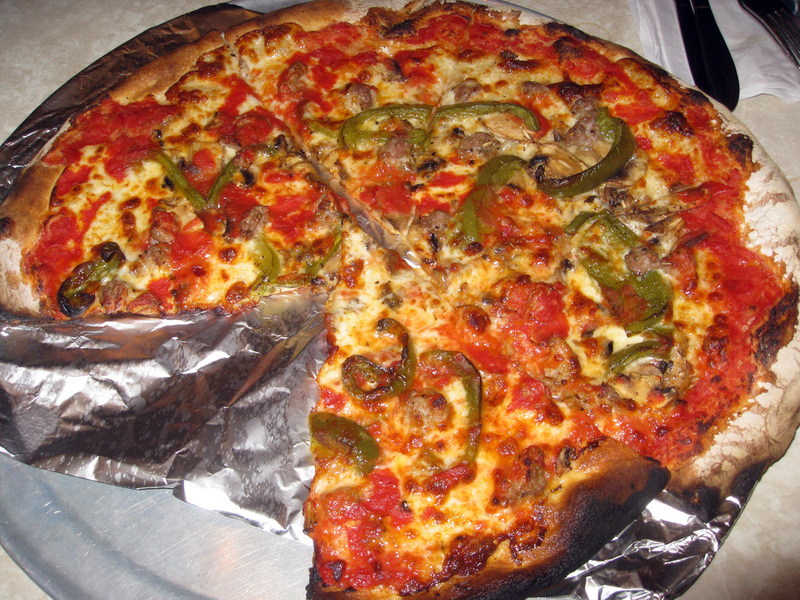 After 20 minutes of discussion, we decided on a medium, 6 slices, with our own combo of toppings: meatballs, peppers, and mushrooms ($12 + $2 per topping = $18) The pie has a very thin crust, so it came out relatively fast, maybe 15 minutes. The meatballs tasted immediately of fennel, they were ground, like a sausage, but were not greasy at all. The peppers (green) were cut in large pieces, and the sauce tasted very fresh and light. The crust was at once bread-y and crispy. What I loved about this pizza was its perfect balance, each bite had just the right amount of cheese, sauce, toppings, and crust to render several bites of perfect pizza heaven. Up towards the top, though it got a little dry and sparse. Just a touch more toppings would have been perfect! The 6 slices were light and easy to eat between two. Afterwards, I felt satiated and not stuffed. 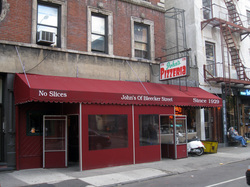 Note: John's only serves whole pies and not slices. John's is old, and small, and dark. The dining room is worn, but clean. The bathrooms are tiny and clean, though not spotless. Casual, comfortable, and unique atmosphere that time has not altered. Great pizza. Fast service. Reasonable prices. One server was not as nice as the other, pizza a little dry towards the top, even before they burnt it.